This particular set of shots came from two encounters that day. The morning one and then another brief encounter just before leaving that first day. The execution was significantly better the second time, now being aware of how they moved. The specimen above does not possess the coloring seen in upcoming shots. True to course with my online reference materials lately, the reason for this was not easily determined. Even my Audubon Android app failed to address this detail. This gives me some latitude so I’m going with the reason is it is either a juvenile or a female. I’d research it more, but the last 30 minutes has been fruitless and the pillow is screaming out my name. Here is a shot showing the colored spot behind the ears. News to me, these birds come from the ground Cuckoo family or if it helps, the family of Geococcyx (Pat, I’d like to buy a vowel please). They have been popularized by Looney Tunes which played on their incredible ground speed. They can go up to 20 mph on the ground, but apparently do have the ability to fly very short distances. 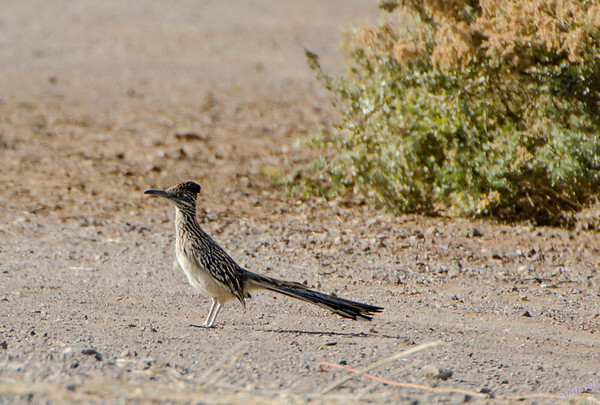 Truth be told we never saw these birds take flight, instead preferring to dash to and fro across the desert. 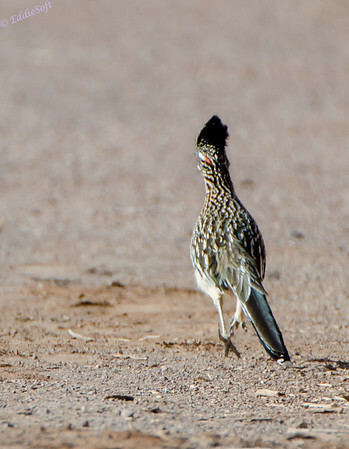 With the help of our friends over at Wikipedia, I learned that these birds are zygodactyl but assuming you already knew that (psst, that is just a fancy name for having two toes in front and two toes in back). 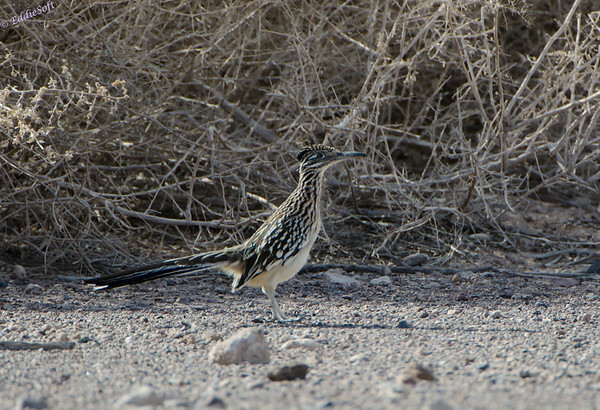 They carry an average size of 20 inches from beak to tail making them fairly easy to spot as long as they are contrasted with a different color palette – they blend in very well to the desert and rock based roads. It appears to me (and again, unconfirmed) that that they have the ability to retract their crown. The shot above looks like it is down where the shot below clearly has it more pronounced. This characteristic plus their large tail must give them the quick reflexes on display while we were at Henderson. This trait must come in handy for these omnivores since they live on a diet of lizards and other small mammals. 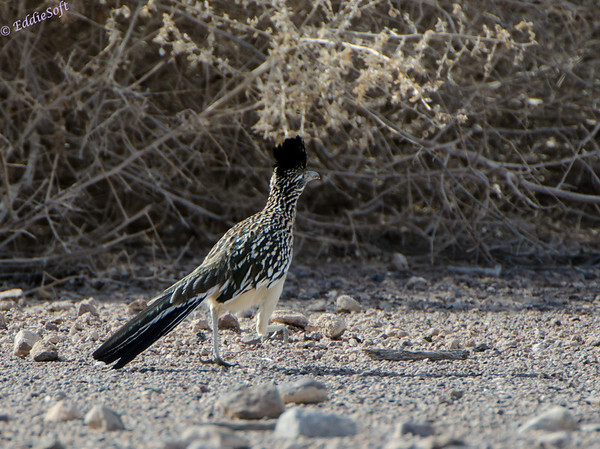 Note, this also includes… wait for it… rattlesnakes – Linda’s new favorite bird. Alas, there are no shots of it racing down the road with a rattler hanging from its beak. Thank god for Linda’s sake. We never really witnessed it eating anything while we were there. 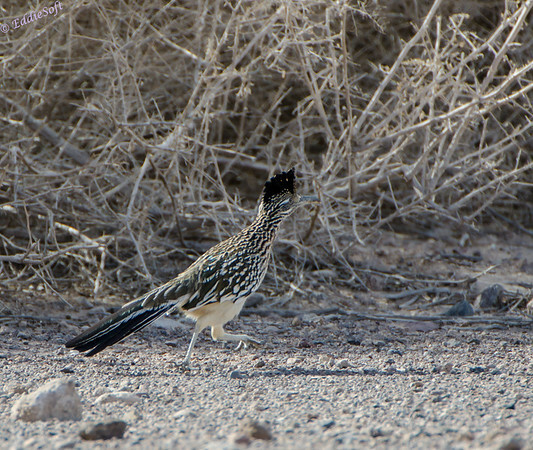 It just ran along the road darting in and out of ground cover as the Beast tried to track its every move. One thing evident during the shoot is these creature’s appearance gives them the look of being pissed off. Would be interesting some time to track down why Looney Tunes opted to portray them as lovable, happy birds with a slight grudge against conniving coyotes (again, the pillow is calling or I would have tracked that down for you). Not much else left to say about this particular bird other than how thrilled I was to check if off the list. Within 10 minutes of being at this Preserve, there were two more checkmarks in my book. Figured I’d leave you with a quick quiz.. find the bird! 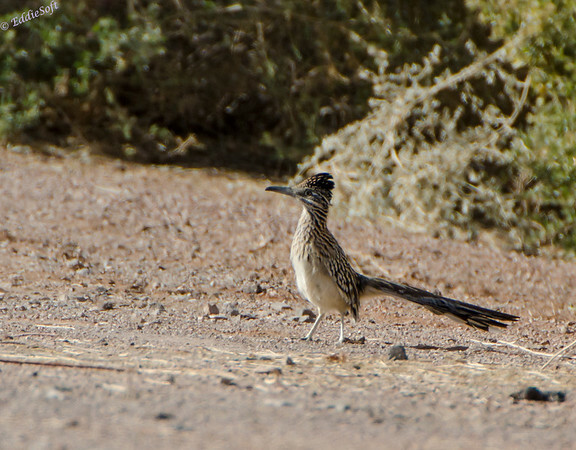 I’ve never seen a photo of a Roadrunner much less the actual bird, so this is cool–thanks. And I learned a new word: zygodactyl. Sounds like a dinosaur one better than a pterodactyl. BTW, a tip: the next time you’re in this situation of having to capture a fast-moving animal, maybe Linda could snap off a photo. Holy crap there’s rats on Mars!! That’s it, no more proof needed, we have a picture that tells it all. By the way, did you see our last vacation shots from Saturn? Their spectacular although it was a little cold for our taste. Now, are pterodactyl still in the text books? Ever since my early education lied to me about the Brontosaurus I’ve been suspicious of ALL dino research. Ummm are you suggesting the best way to take a picture of a fast moving object is to just set the aperture to 22 and fire away indiscriminately?